Between fevers, congestion and diarrhea, there are numerous ways that microbes can make us feel sick. But just how do microorganisms cause these symptoms? At any given time, the microbes inside of our bodies outnumber our own cells by at least 10 to 1. In general, these tiny organisms are harmless — and often beneficial — to us, but some bacteria, viruses, fungi and protozoan parasites cause nasty diseases. For example, Escherichia coli can cause diarrhea, rhinovirus is behind the common cold and the fungus Cryptococcus neoformans can bring about a severe form of meningitis. Many disease symptoms that befall us are actually caused by the immune system's response to invading pathogenic microbes, rather than something the microbes are doing, specifically. Take, for instance, the common cold. When the rhinovirus gets into your upper respiratory tract and invades epithelial cells (those that line the cavities in the body), it triggers inflammatory and immune responses. Certain cells release histamines, which dilate your blood vessels and increase their permeability, allowing white blood cells and some proteins to get to the infected tissues. You often experience nasal congestion because your inflamed blood vessels are now so large that they stuff you up. But histamines also affect the amount of mucus your body produces, as well as its viscosity — this altered mucus production, along with the increased fluid leakage from now-permeable capillaries, can cause a runny nose. Similar immune system reactions take place when you develop pneumonia, which is most often caused by bacteria and viruses (especially the bacterium Streptococcus pneumonia). Your body has pretty decent defenses to keep microbes out of the lungs, including nose hairs that filter air and certain reflexes (coughing and sneezing) that shoot microorganisms that enter your body back out. But sometimes that's just not enough. If bacteria get inside the alveoli (tiny air sacs in the lungs), they can invade the spaces between cells and even travel to adjacent alveoli. Your immune system responds by once again inflaming your blood vessels and making them permeable, allowing white blood cells and proteins to come to the rescue. But this permeability allows fluids to seep into the alveoli, taking up space that's needed for the oxygen-carbon dioxide exchange. You become somewhat oxygen deprived and exhibit the shortness of breath that's a common symptom of pneumonia. Moreover, your respirations increase as you try to bring more oxygen in and blow more carbon dioxide out. Pneumonia and the common cold are also marked by fever, something that also arises because of our immune system. When white blood cells called macrophages encounter bacteria or viruses in your system, they produce cell-signaling proteins called interleukin-1 (IL-1). These proteins do two things: They call in helper T-cells and they bind to certain hypothalamus receptors in your brain, causing a rise in your body temperature, which is thought to help kill some pathogenic microbes. Substances that induce fevers, such as IL-1, are called pyrogens; some bacteria can induce fevers with pyrogens, too. Bacteria are divided into two major groups based on the structure of their cell wall: Gram-negative and Gram-positive bacteria. The outer membrane of Gram-negative bacteria, such as E. coli and Salmonella, contains large molecules called lipopolysaccharides, which are made up of lipids and polysaccharide (sugar) chains. These molecules are also called endotoxins (pdf), and they can act as pyrogens. When certain cells called phagocytes engulf the bacteria, lipopolysaccharides get released, which in turn causes macrophages to release IL-1. These proteins, as you know, cause fever. But endotoxins can do a lot more than cause fever. For instance, if the bacteria Neisseria meningitides reaches the brain from the bloodstream, it can cause bacterial meningitis (Meningococcal meningitis). Endotoxins stimulate the synthesis of pro-inflammatory molecules called cytokines. So when the bacteria reaches the blood-brain barrier, a sharp inflammatory response ensues, causing cerebral blood vessels to leak protein and fluid, and swelling to develop in the membrane between the brain and skull. These changes lead to an increase in intracranial pressure, resulting in the common meningitis symptoms of headache, stiff neck and sensitivity to bright lights. The pressure on nerves and decreased blood flow starves the brain of oxygen, leading to permanent brain damage and sometimes death. The bacteria are more deadly if they stick to the bloodstream, where they can cause a blood infection called sepsis. This ability is partly due to the fact that N. meningitides's endotoxin concentration is up to a 1,000 times greater than that other Gram-negative bacteria. The toxins target the heart and reduce its ability to pump blood, while also causing blood vessels throughout the body to rupture (more specifically, white blood vessels cause the breaks with the chemicals they release in response to the endotoxin). As the vessels throughout the body leak, blood pressure drops and blood flow slows, leading to the failure of some major body organs and systems, including the kidneys, liver and central nervous system. The disease can manifest a number of conspicuous symptoms, such as fever, light-headedness, rapid heartbeat and skin rash (from the blood leaking under the skin). While only Gram-negative bacteria use endotoxins, both Gram-negative and Gram-positive bacteria can cause disease symptoms using exotoxins, a type of protein toxin. Exotoxins are grouped into categories based on their biologic effect on cells: Cytotoxins kill or damage cells, neurotoxins interfere with nerve impulses and enterotoxins affect the intestines. Many well-known disease symptoms are traced back to exotoxins secreted by various bacteria. For example, the Gram-positive bacterium Streptococcus pyogenes releases three cytotoxins — one of its toxins damages blood capillaries, causing the infamous red rash of scarlet fever. Clostridium perfringens releases a toxin that disrupts normal cellular function and leads to the mass tissue necrosis commonly known as gangrene. And when Corynebacterium diphtheriae is infected by a certain bacteriophage (bacteria-infecting virus), it can release the diphtheria toxin, which inhibits protein synthesis in cells and eventually causes their death. The cytotoxin can affect a wide range of tissues, and at high concentrations will produce diphtheria's characteristic swollen neck, often called "bull neck." Bacterial neurotoxins are equally well known and scary. The uncontrollable spasms and convulsions of tetanus are all thanks to Clostridium tetani's neurotoxin, which blocks the relaxation of skeletal muscles. Clostridium tetani's relative, Clostridium botulinum, excretes a very potent neurotoxin that inhibits the release of the neurotransmitter acetylcholine — this inhibition prevents the transmission of nerve impulses to muscles, resulting in paralysis. Now, let's not forget about the wonderful enterotoxins that screw up our intestines. Vibrio cholerae's cholera toxin (pdf) affects the ion transport and water balance in the intestines, causing epithelial cells to discharge large amounts of fluids and electrolytes. Some toxins produced by E. coli work in a similar way to the cholera toxin, while others are known to affect the intestinal blood vessels, causing bloody diarrhea. Though we've covered quite a bit already, we've really only brushed the surface of how microbes bring about disease symptoms. Diarrhea, for example, can also come about when the single-celled parasite Giardia lamblia coats the intestines and prevents nutrient absorption. And the pain and frequent urination associated with urinary tract infections result from inflammation (pain from inflammation occurs only when the appropriate sensory nerve endings are in the inflamed area). In addition, boils and other abscesses (such as those from a staph infection) can develop after bacteria populate a cut or break in the skin. Neutrophils, which are a type of white blood cells, rush to the infection, leading to inflammation. Eventually, pus forms from the mixture of old white blood cells, dead skin cells and bacteria. 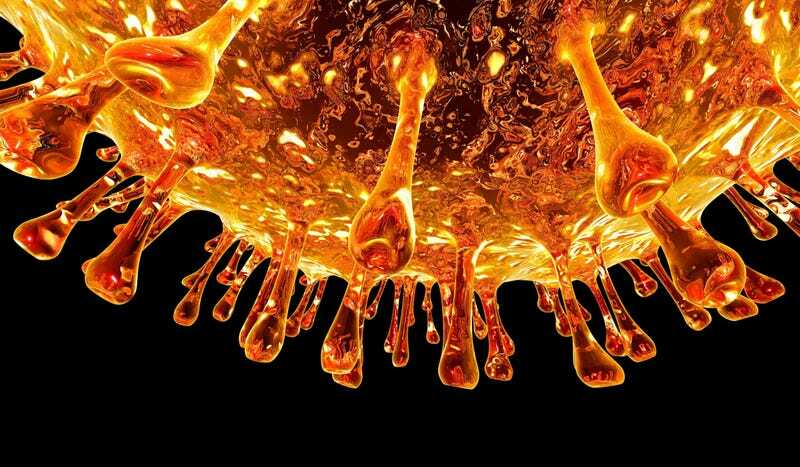 And let's not even get into viruses, which produce symptoms by triggering immune responses (like the rhinovirus), interfering with cells' normal processes or destroying cells by exploding out of them. The ways in which microbes produce disease symptoms are about as varied as the microbes themselves. Some microorganisms mess with our bodily functions, while others are satisfied with just destroying our cells. And, of course, there are all of those pathogens that turn our own immune system against us. Evil buggers. Other sources: CDC, WHO, FDA. Rhinovirus, E. coli, S. pyogenes and G. lamblia images via Wikimedia Commons.